American skin covers this continent. The people; the landscape: a surface upon which our eyes play curious, lustful, tragic, and loving. A body of so many histories and so many origins covered by a single American skin. Peeling back the surface exposes the unique, miniature stories of individual cells in the corpus, and the collective story of a country's complexion. In summer, 2010, photographer Diana Scheunemann undertook an eight week road trip clockwise around the USA, starting and ending in New York. The aim of the trip was to photograph, film and explore the multiple facets of American identity from Diana's unique perspective. 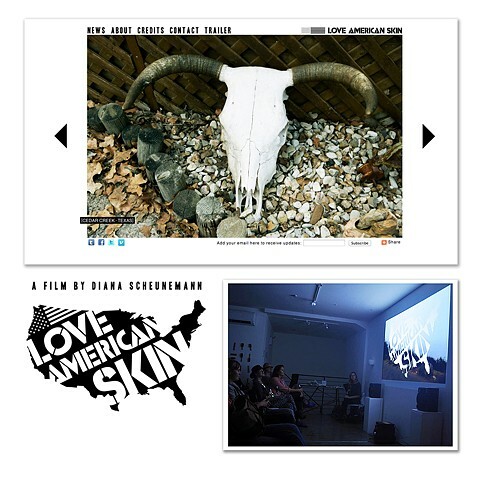 The people that she met, filmed and photographed en route have become part of a project that she calls Love American Skin which she is presenting online, in gallery exhibitions and in a feature length art film with the same title.